Some centuries ago, me, my best friend Debbie, my Mum and Granny were playing our summer holiday, nightly Canasta tournament, into the wee small hours. My usual annoying ‘a fast game is a good game!’ quip was interrupted by three piercing screams. A giant, juicy, mouse-sized (not including legs), Huntsman spider was pootling along the nearest wall. Had the spider resembled a mouse in anything more than size, I too would have turned to jelly. As it was, someone had to be a man* about things and I boldly snatched a saucepan, a bit of newspaper and captured spidey with a kerplunk into the pan. As he was tapping away looking for the nearest saucepan exit, I'll admit that walking out into the deathlike quiet of a moonless night was daunting. Removing the newspaper lid and blindly flicking spidey into the dark, was also a fine and courageous act. I have never known glory as bestowed upon me by three hysterical canasta opponents. Had Mariah Carey been around to sing Hero, no doubt she would have fronted up to the door then and there and had a three piece backing vocal. As it was, all that was available was an uninspired looking biscuit and a bit of string. Mum fashioned me an edible medal, there was a presentation ceremony and giggly fits of three-in-the-morning hilarity. From that moment on, whenever I win anything – be it a three legged race, a calisthenics solo performance (replete with stunning side stage entrance cartwheel to the Star Wars theme), or a blog award, I think of the original bikkie medal. Which finally brings me to the point of all this long-windedness. 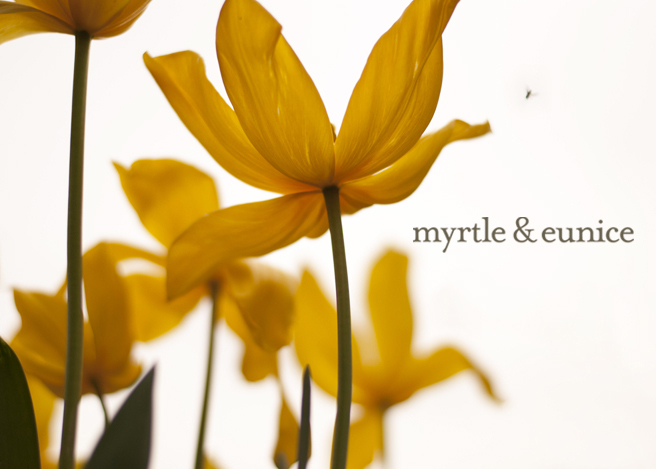 Over the last couple of weeks, Kate at One Flew Over, Lisa at Cute as Buttons and Lou from Buttons by Lou Lou have bestowed the One Lovely Blog Award upon Myrtle and Eunice. I am chuffed and blushing on behalf of the ladies. Many hearty thanks to you. Gina is the genius behind the inspired Swiney softie, appeals to my sense of the absurd and tackles real life with great aplomb. Claire appears to be able to torment any sock in to a characterful softie delight. Beck’s blog makes me want to crawl under a granny blanket in a cosy corner and knit stuff. Just when I think nothing else could be done with felt, Floortje serves up another beautifully crafted something. Claire has some lovely photography, gorgeous jewellery (and a giveaway if you hurry over by the 6th). If it’s a grey old wintry day, head on over to Andrea’s for a veritable explosion of colour and crafty know-how. Sewer of gorgeousness, with a current vinyl obsession (after a 20 metre vintage find) and a feisty streak that comes out at garage sales. It’s a case of I have no idea how Nikki does it, but along with one year old twins, she has one heck of an imagination, leads the field in emergency softie surgery (but has unfortunate taste in music). A wicked sense of humour, some inspired storytelling and excellent crafty tutorials to be found over here. Prone to even longer post titles than me, Nanette is one of those who crafts personality into everything but prompts tea-spluttering-over-keyboard-laugh-out-loudness. There’s an impressive vintage button collection and quirky random pics lurking around here. Even after all this time, Soulemama still reminds me to breathe. You never know what critter is popping up on Jo’s blog, but they all have their own uber personality. No one else could write about middle-of-the-school-holiday-shopping-centre-jean-purchasing with such startling honesty. Jodie also has, oh, a truckload of crafty creativity. Nikki knows real stuff about making really nice stuff. And she generously shares a bounty of information. Plus she has a kid who wears her coat upside down to the supermarket. Awww, shucks! 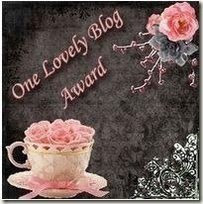 And thanks for the lowdown and heads-up (makes for an interesting dance move, no doubt) on so many other lovely blogs. And yes - memory of the Safeway trip in the upside-down coat still makes me smile!! Well congratulations (on both counts)! You deserve it! And I am so with you on soulemama. I keep expecting my love to wane but it just doesn't. Next time I have a spider emergency, I know who to call! Well done on the awards!! 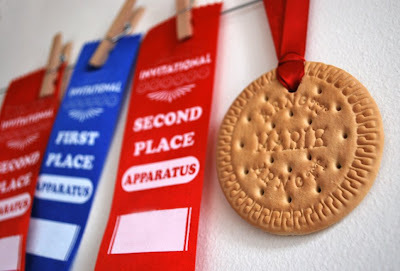 Love the biscuit medal idea - simple and sweet. spider catching, stunning side stage entrance cartwheels, brilliant design... is the ANYTHING you can't do? hehe, that story cracks me up! Hilarious story! I am inspired both by your spider bravery or the fact you play canasta. I absolutely love canasta and it's rare to find someone else who can play it. heya , Thanks - what an impressive list to be included in !!! got stamps, now I only need to go hunting for some cool summer cards..
thank you lovely lady. and an edible medal is a genius idea! What a gorgeous story, reminds me of those late nights I'd have with my family and a canasta pack, minus the big chunky mouse like spider...ewww. I love your blog, you have a fantastic writing style. Aw, shuckles! Thank you so much for such high praise :-) I would like my (vegan) edible medal delivered to the lake in the middle of Malaysia just under the sun and to the left of the rainforest. Thank you. And OMG, OMG, OMG, if you saved me from a flesh-eating, eyeball-swallowing monster of a s*&%#r like that, I would personally don one of Mariah Carey's outfits, organise my own 3-part vocal troupe, and sing hero while standing on a giant white chocolate ice cream cake. You deserved every accolade you got. Thanks for the bonus bikkie mention... I feel very special. Although I did imagine standing on the dias, national anthem belting out, bending down to have the biscuit medal delicately placed over my head then RIPPED away as you threw in the hurtful comment about my music taste (something which I have clearly explained!). "Did you ever know that you're my hero? You're everthing I'd like to be. Cause you are the wind beneath my wings". You had me at 'canasta'. Anytime you are heading in the Canberraly direction I'll have a pack of cards on hand and a baker's dozen of Maries. PS Thanks for including me. PPS I think there is a blog post calling out to be written on the whole calisthenics solo performance issue. I am not surprised that your blog has been nominated so many times, I am always excited to find if their are new M+E stories in my blog reader, always great and gorgeous photos.